Mustis Family Apartments is a quiet, relaxed resort in the beautiful city of Marmaris. Just over half a mile from the beach and close to a plethora of shops and eateries, this complex is a great base from which to explore. A spacious outdoor swimming pool, surrounded by sun loungers, gives guests plenty of space to relax, and the pool side bar serves food throughout the day, with an outside eating area. Mustis Family Apartments features a separate children’s pool and playground and several sports activities are available – a fun factor for active families visiting sunny Turkey. Mustis Family Apartments is a short walk from Marmaris city centre and tourist attractions like Marmaris Castle or Marmaris National Park are close by too. 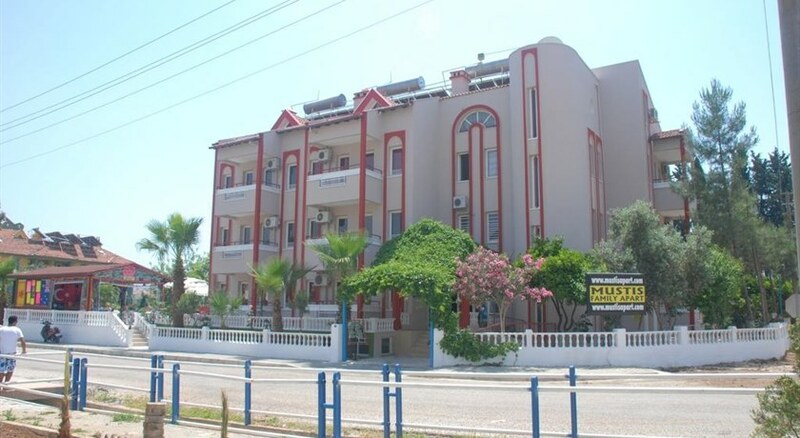 Mustis Family Apartments is around a 45-minute drive from Dalaman Airport and is set in a beautiful landscape of turquoise sea and golden sand. Home to a chic and modern marina, but with an enchanting Old Town not far from it, Marmaris is a diverse coastline where guests can do something different each day. Mustis Family Apartments is close to historical points of interest including the Roman Amphitheatre, and guests can enjoy being surrounded by natural beauty by hiking the Marmaris Mountains. Mustis Family Apartments is close to several bars, clubs, and late-night restaurants, and the nightlife in Turkey is buzzing. Mustis Family Apartments has 23 guest rooms in total, with guests having a choice of studios or larger apartments for families. Studios have a twin bed, ideal for solo travellers or pairs, and have an en-suite bathroom and kitchenette, including a fridge and microwave. A telephone, hairdryer, and satellite TV are included for guest’s convenience and most rooms have a private balcony or terrace. The larger apartments have all of the above and a comfortable double bed ideal for couples. All rooms are air conditioned and room service is available. Mustis Family Apartments is handicapped accessible. Mustis Family Apartments has an on-site restaurant for guests to dine in. Breakfast consists of a traditional Turkish menu, and international cuisine. There is a variety of soups and salads available throughout the day. Children have lots of options at Mustis Family Apartments and special dietary requirements can be met upon request. If guests wish to eat out, there are plenty of options within walking distance, including Mediterranean, Italian, British, and a steakhouse. There are also plenty of bars in the area, with themed entertainment found in a Piano bar and a Jazz Club. The Mustis Family apartments has a lovely garden area in which guests can relax and unwind. The outdoor pool is large and refreshing, and its adjacent sun loungers are perfect to catch some rays, or to dine al fresco. Children have a separate pool and the resort features table tennis, table football and darts for more entertainment. Marmaris is a treasure trove of attractions and things to do including waterparks, beautiful beaches, and nightclubs, and historical curiosities like castles and forts. Marmaris Mountains are a breathtaking sight and for the adventurous types, Marmaris Atlantis Waterpark is well worth a visit. We had a great time here last August. The rooms are basic, with very little self catering provision, but they offer a very good meal deal of breakfasts and evening meals which were good value and excellent quality. Otherwise we ate in one of the numerous restaurants about 20 minutes walk away ( or air conditioned taxi when it was too hot ) We were in the pool every day and drinking cold Effes beers. We arranged various excursions through Memeht, which saved running the gauntlet of all the touts on the sea front. I would recommend the water pistol jeep safari and the quad biking, Turkish massage and cruise with mud bath good too. Overall good value and an excellent resort.